"This formamidinium lead iodide material has very good characteristics, but the A position formamidinium ion causes instability in the structure," explains Loi. Three-dimensional films made from this material most often turn out to be a mixture of a photoactive and a photoinactive phase, the latter being detrimental to the final application. Loi therefore set her Ph.D. student Sampson Adjokatse to work to find a solution. After testing possible strategies, he found one that worked. "And most importantly, one that is scalable and could be used for industrial production," says Loi. After all, solar cells must be produced in large panels and it is very important to find a good and cheap technique to do so. 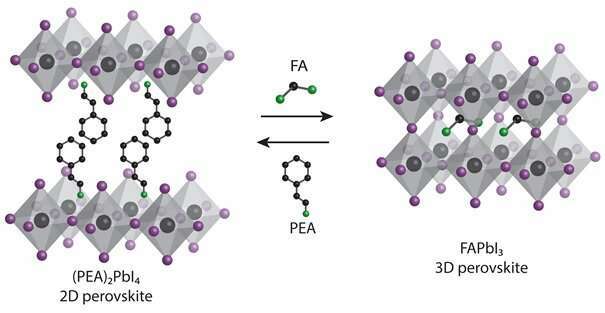 Adjokatse started with a different perovskite, in which the formamidinium was replaced by a larger 2 phenylethylammonium molecule, and in doing so formed a 2-D perovskite. This material was deposited as a thin film using the "doctor-blade" technique, related to techniques widely used in industrial processes such as printing. "Basically, you spread the material onto a substrate using a blade," explains Adjokatse. The blade can be set to produce a film with a thickness of around 500 nanometres, creating the 2-D perovskite layer. "The important point is that these films are very smooth with large crystalline domains of up to 15 micrometres," says Adjokatse. The smooth 2-D films based on 2-phenylethylammonium lead iodide were used as a template to produce 3-D formamidinium lead iodide films. This was achieved by dipping the 2-D film in a solution containing formamidinium iodide. This resulted in the growth of a 3-D film through 'cation exchange," where formamidinium took the place of 2 phenylethylammonium. "These films show much higher photoluminescence compared to reference 3-D formamidinium lead iodide films and show increased stability when exposed to light or moisture," says Loi. "This means that we now have a method for the production of high-quality films for perovskite solar cells using an industrially scalable technique."